He is known to have a close bond with his children, and is often seen heading on a number of fun days out with his brood. 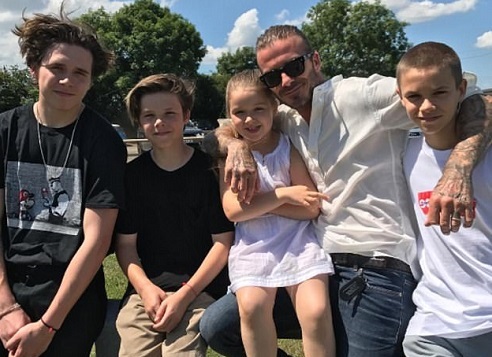 And Victoria Beckham was quick to pay tribute to her loving husband David for Father's Day, by posting a sweet family snap on her Instagram page. The 42-year-old led the charge of celebrity posts celebrating the special day by sharing a photo of David cuddling up to Brooklyn, 18, Romeo, fourteen, Cruz, twelve, and Harper, five - before praising him as the 'best daddy in the world'.